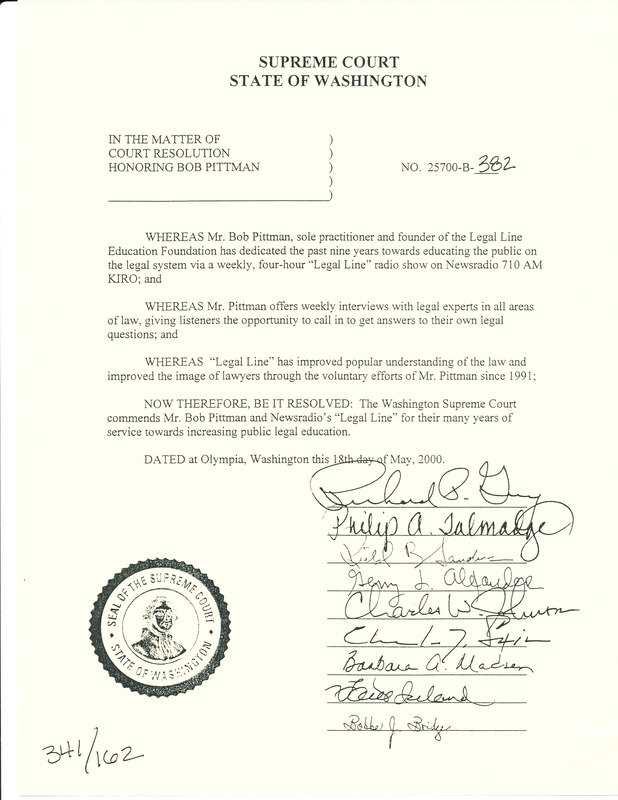 Legal Line® has been your place to call in with legal questions since 1991. The program originated on CBS affiliate KIRO Radio in Seattle, Washington, and aired for many years on the “blowtorch” of the Northwest. We have always tried to demystify the law, translate the legalese and point you in the right direction with regard to your legal problems. You’ll find Bob appearing as a guest from time to time on various radio programs. And, you’ll find podcasts on different topics here on the legal line page. Check out the podcasts of Legal Line’s prior programs and Bob’s blog postings. For his work on the air, Bob received the Consumer and the Law Journalism Award from the Washington State Trial Lawyers Association, was honored by the Washington State Supreme Court in a special Court Resolution, and received the Excellence in Legal Journalism Award from the Washington State Bar Association. You can find previous Bobcasts on the Legal Line® Archive Page. Listen to Supreme Court Justice Phil Talmadge present Bob with a special Supreme Court resolution on Legal Line.